Judging by their overtly bombastic musical endeavours and fantasy-themed, grandiose songs bordering on the hilarious, many might consider Blind Guardian a humourless band. The Forgotten Tales however, is an album that should leave all such suspicions lying in the dust. The record is mostly comprised of cover versions of the band’s choice cuts from a wide base of rock history and some re-recorded and –arranged versions of original material. Blind Guardian’s music itself is a melting pot of several very different styles, so the range of the palette on display here comes as no surprise. The cheerfully poppy Mr.Sandman is given a chrome-plating with some hard-hitting walls of guitars. I still crack up upon hearing Hansi doing the songs signature pampampampam’s. The Beach Boys’ classic Surfin’ USA is also spanked up with furious spikes of double bass drums. I love the original song but this version kicks some absolutely humongous derriere. Uriah Heep’s The Wizard and Queen’s Spread Your Wings stay closer to a basic hard rock-style which works marvellously too. To France by Mike Oldfield is turned into a signature medieval ballad with jangling guitars and a really strong marketplace atmosphere. My favourite of the covers however, is the medley of another Beach Boys-classic, Barbara Ann and the oldies rock n’ roll standard Long Tall Sally. There is no limit of decency when talking about the insidious amount of air guitar this song forces me to belt out. BG nails the boogie of the 50’s down perfectly and the lyrical additions from Johnny B. Goode in the middle bring the icing to the fun. The reworks are mostly awesome as well. Bright Eyes and Mordred’s Song are performed fully acoustically resulting in excellent versions, especially with the former’s flamenco-influences. Lord Of The Rings and Black Chamber are pretty close to their original versions, with some orchestral additions. I actually like this recording of LOTR even more then the already good original. The live recording of The Bard’s Song is pure karaoke bliss with gigantic crowd participation throughout the song. Anyone who has seen Guardian live or has their DVD knows exactly of the brilliance I’m talking about. The only filler track that I don’t listen to so often is the orchestral instrumental of Theatre Of Pain. It ain’t bad – I just can’t find much purpose with this version. The production and performance from the band are both solid as steel and every bit as good as on their other studio albums. The Forgotten Tales has always been a bit of a oddball favourite of mine because of its thundering energy and excellent cover choices. 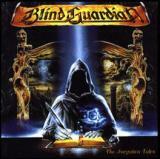 For every Blind Guardian fan it is a must have but to even casual listeners and people who wouldn’t even normally give time for metal, I would recommend it wholeheartedly. In my wildest hopes it can even do the opposite as well – introduce killer older bands like the Beach Boys to metal fans.